It’s the far future. Corporations battle one another in cyber space to gain information and contracts. To do that, they need hackers. That’s where you come in. Cyber Sentinel pits you, a hacker, against various security systems that you have to break through. Visually, every system has some of the same elements, which are the core of the game. 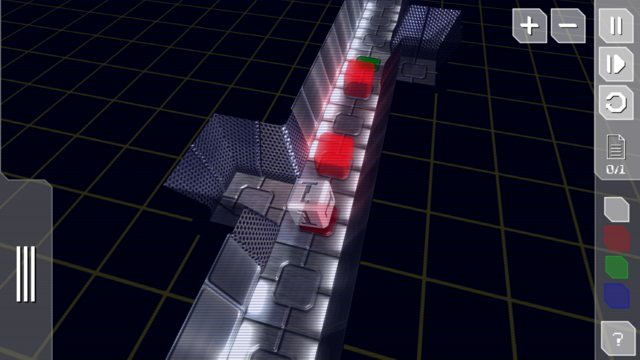 Your hacking program is represented by a cube, while the enemy system is represented by a file. To reach that, you must move your cube through a maze. Of course, that is not easy. Touching the walls means you have just come across the firewall and you are dead. Moreover, there are more things in the way to stop you, such as lasers. The way to get through all of those objectives is programming. At the start of each level, you are free to survey every area of the map. Afterwards, you can open up the programming tab, and give your cube the instructions it needs to get through any obstacle in its way. The programming tab is rather simple, containing only five commands. Four of these are directional, which make your cube move left, right, up or down. The last one is blank, and makes your cube stop moving. The way you arrange these commands is like puzzle pieces. You always start from a blank command, and then you can just drop new commands wherever you want in the programming tab. Afterwards, you connect the commands with arrows, which can be grey, red, blue or green. Grey is the default color, while the other three correspond to colored marks you can place in the map. These acts as triggers for actions. For example, to make your cube turn right, you place a red marker on a map tile, then connect the right command with a red arrow. Generally, the game’s gameplay is beautiful in its simplicity. While there are not many things you can order your cube to do, there are enough that you can do some very complicated things. These might seem hard at first, but the feeling you get when you manage them is amazing. This feeling is intensified through the game’s music, which is appropriately cyberspacey and futuristic. Although the core of the game is fine, there are elements that could have been much better. First of all, the graphics. Sure, there is a reason why they are so empty. They are meant to represent Cyberspace (and also the game is made for both PCs and mobile phones). However, I feel that if they were a bit more alive – like with random glitches happening once in a while – it would make the game more immersive. The only game graphics that I really enjoyed were the comics used to tell the story. Speaking of the story, it’s just there. It’s not something atrocious, but it’s shallow. It’s basically the standard hacker story we all know and “love”. Sure, quite a lot of people will not buy the game wanting a good story, but again, it would have made the game more immersive and attractive. By far the biggest gripe I have with the game, however, is the tutorial. While it is indeed sufficient for the basic stuff, there are some more advanced things in Cyber Sentinel which the game does not teach you well. The reason for that is, instead of following the standard procedure of telling you “here is thing x. By placing it in y, this happens” it just makes you do it. This would have worked, only it is done so fast and without explanation at all. This made me see what was happening, but not really understand how to replicate it. All in all, mindhelix, the company behind Cyber Sentinel, has done a good job in my opinion. Cyber Sentinel tests your mind and your problem solving skills in a very interesting way. However, it could have been a lot better if a little more time had gone into it. You can find Cyber Sentinel on Steam for 10 euro. 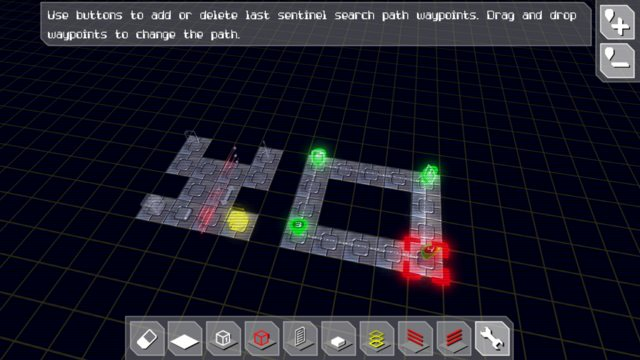 Cyber Sentinel is a very smart puzzle programming game that is bound to test your brain. Despite that, it fails to achieve its full potential due to lack of polish. – Shallow story and poor graphics.